Actress Catherine Deneuve will hit a milestone birthday this month, turning 75 on October 22, but she shows no signs of slowing down. In honor of the occasion, here are just a few films to help you get to know her career. Umbrellas of Cherbourg (Les Parapluies de Cherbourg, 1964) is a melancholy drama of youthful romance in which all the dialogue is sung, as in an opera (but not in an operatic singing style). With a striking 1960s color palette and music by French jazz pianist and composer Michel Legrand, it's one of the great films of the 1960s (and it inspired La La Land). The love story has a mythic sweep. Deneuve is an ingénue who learns the often bittersweet truth of first love. The Young Girls of Rochefort (1967) is also written and directed by Jacques Demy and sung to music by Legrand. But whereas Umbrellas is haunting and sad, Young Girls is a trumpet blast of sunshine. Twins Delphine, who teaches ballet, and Solange, who teaches music, and their mother, Yvonne, who runs a cafe, cross paths with potential loves old and new as a fair comes to town one weekend. The film features a late-career Gene Kelly and West Side Story's George Chakiris. Denueve co-stars with her real-life sister Françoise Dorléac, who sadly died shortly afterward at 25. They have wonderful chemistry on screen, and you have to wonder what other films they would have made together. Deneuve worked with one of the most acclaimed directors of world cinema, Luis Bunuel, in Belle de jour (1967) and Tristana (1970). These movies helped establish her as an important actress and continue to be considered classics. Belle de Jour concerns a housewife who has trouble being intimate with her doctor husband and begins filling her afternoons with fantasies and working in a high-end brothel. In this surrealist story, the line between dream, memory and reality becomes blurred. Tristana concerns an orphan young woman adopted by a nobleman who falls in love with her. Denueve's other key early film of the 1960s is Repulsion, a psychological horror film that explores the mind of a troubled young woman. In The Last Metro (Le dernier métro, 1980), directed by François Truffaut, Deneuve plays an actress who must protect her Jewish husband while running their theater in occupied Paris during World War II. Deneuve rode another wave of success with Indochine (1992) and My Favorite Season (Ma saison préferée, 1993). Earning Deneuve an Academy Award nomination, Indochine is set at the end of French colonial rule in Vietnam. In the film, her character is raising a Vietnamese princess as her own daughter and they both fall for the same man. In My Favorite Season, Denueve plays Emelie, a woman whose aging mother moves in with her, which causes her to reach out to her estranged brother, Antoine. In this sophisticated drama, Deneuve stars with real-life daughter Chiara Mastroianni (whose father was the late, great Italian actor Marcello Mastroianni). It's also worth calling out a couple recent movies distributed by Chicago's own Music Box Films: Potíche (2010) and The midwife (2017). Potiche is a fun, deliberately campy comedy set in 1970s France, in which Deneuve plays Suzanne, the "trophy wife" of an executive. She's expected to look pretty and keep her opinions to herself. Her talents are dismissed even by her kids, but when a crisis strikes, it's Suzanne to the rescue. It's a little bit like a French 9 to 5. (If you like that one, also check out 8 Women (2002), which takes an Agatha Christie-like murder mystery setup and turns it into a comedy starring eight great French actresses.) The Midwife is a drama about a midwife who becomes unlikely friends with her father's mistress, though the two are complete opposites. Of course there are many more highlights to her career, including, to name a few: A Christmas Tale, Time Regained, Donkey Skin and even a vampire movie, The Hunger. 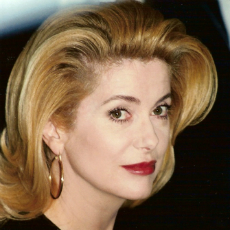 Bon anniversaire, Catherine Deneuve!